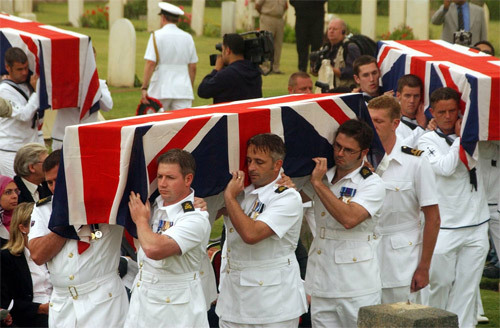 British miltary carry coffins containing remains of 30 British sailors and soldiers, who lost their lives during the Napoleonic war 1798-1801, during a military funeral in Alexandria, Egypt, to rebury them Monday, April 18, 2005. Archaeologists had found the remains during a dig on an island off Alexandria. Some of the troops died during the Battle of the Nile in 1798 when British warships commanded by Admiral Horatio Nelson defeated Napoleon's fleet.